TTi's flagship CB - an excellent quality, front-facing speaker, multi-standard set which can operate on either 12v or 24v without user adjustment. Large LCD display and backlighting of the controls which you can choose to be either green, amber or blue. 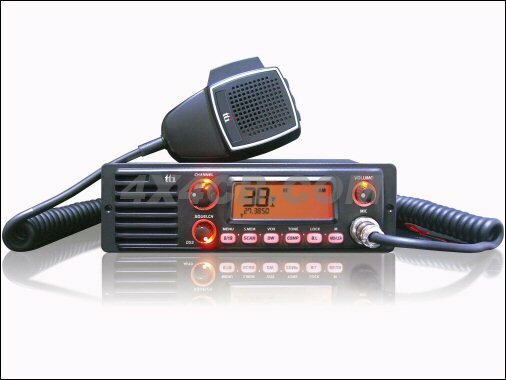 The TTI TCB-1100 has a very high quality feel to it, both in physical terms and with the features it has - it feels and behaves more like a professional business radio than a CB. It features CTCSS which is a version of squelch which allows the user to set a code and only when the radio hears that corresponding code from another set will the squelch open and sound be heard. This is ideal for people wanting to run a "closed group" so you'll only hear people who have a CTCSS enabled radio with the same code programmed in. It has a host of other features too making this a very comprehensive CB. It's supplied with both a normal mounting bracket and a DIN cage for fitting into a spare car stereo sized slot in a dash or cubbybox etc. All in all, an excellent high spec radio. CTCSS Continuous Tone Coded Squelch System in addition to normal operation of squelch as well as "DSS Dynamic Squelch System" which constantly monitors incoming signal and decides if its wanted signals or background noise and allows the wanted signals through but mutes the background noise. There are 38 different codes you can use. Large backlit LCD display shows channel number, frequency, band, received signal strength / transmitted power and legends for all functions. Can be switched for either green, amber oir blue backlighting - all buttons and surrounds to rotary controls also have back lighting. Backlighting can also be dimmed in 3 stages - high, low or off. Quality microphone with up/down channel change and Lock buttons - lock button can also activate a mute function, silencing the radio, handy if you need to speak to someone out of th window or receive a phone call - allowing you to return volume to where it was before, without having to mess around with the volume and squelch again. TOT Time Out Timer function allows you to set a maximum time that the radio will transmit for - very handy if for example your passenger sits on the mic or something gets pressed against the transmit button... you won't be driving around all day transmitting, wondering why you're not hearing anyone! Confirmation tones which beep whenever you press a button can be switched off - excellent! CIGARETTE LIGHTER PLUG FITTED We can fit a cigar plug to the power lead for you... it's only £2 !